There may be no halting the arrival of winter, but BEAR Scotland seems to be doing all it can to ensure any potential disruption is minimised. 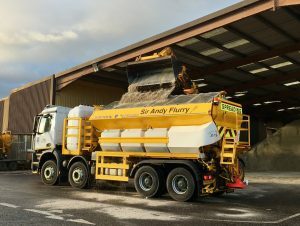 Scotland’s leading infrastructure management and maintenance organisation has revealed that it has more than 58,000 tonnes of salt ready to treat trunk routes across the north of the country. Additionally, its 195-strong winter team and fleet of 120 winter vehicles are dedicated to helping keep the trunk roads as clear as possible this winter. 2018 marks the tenth year that BEAR’s winter 24/7 control room will be central to the organisation’s winter response programme, analysing detailed weather forecasts and road temperatures to ensure treatments are carried out as necessary. BEAR Scotland is responsible for keeping clear 1,265 miles of trunk roads across the north east and north west of Scotland. During last year’s especially harsh winter, the group used over 80,000 tonnes of de-icing materials across nearly 11,000 treatments.